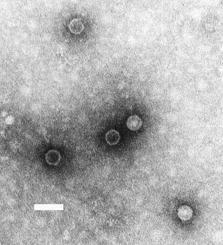 Karl Landsteiner and Erwin Popper prove that a virus causes polio, a crippling disorder that especially targets young people. 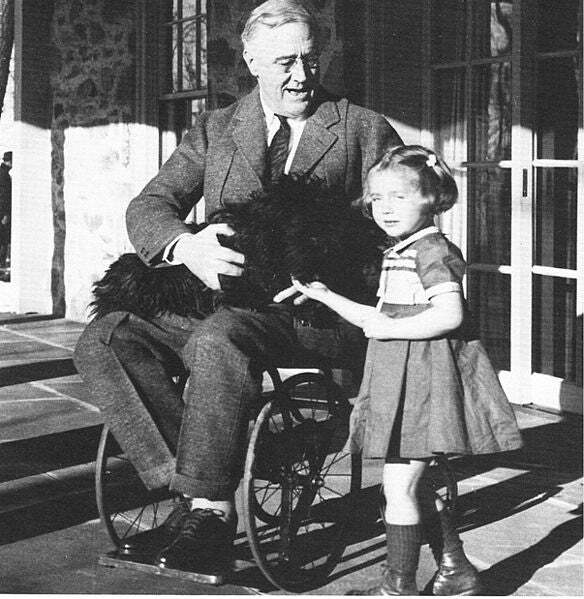 Prominent New Yorker Franklin Delano Roosevelt suddenly falls ill and loses the use of both his legs. Doctors determine he has contracted polio. 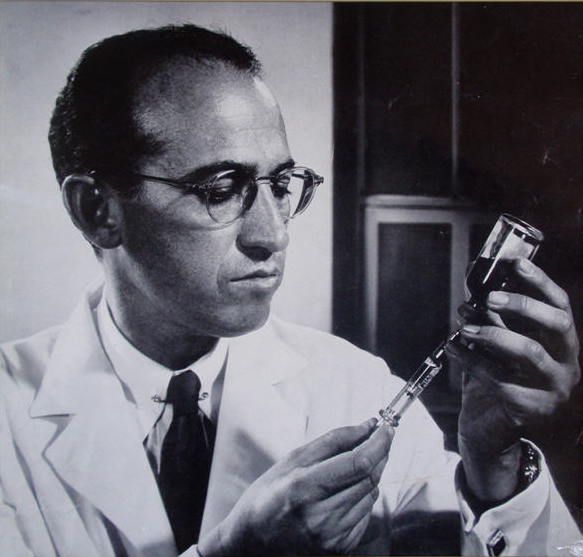 Jonas Salk uses inactivated (killed) virus as the basis of a safe, injectable vaccine against polio. 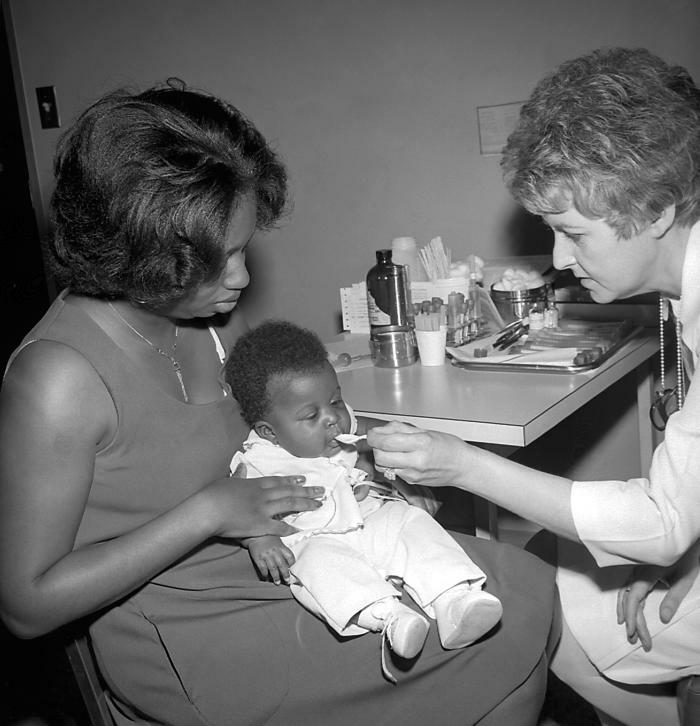 The Salk polio vaccine is tested on 1.8 million children in U.S., Canada and Finland. 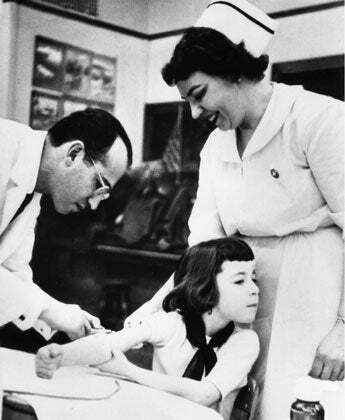 Jonas Salk gives the vaccine to a child as part of a field trial at a Pittsburgh elementary school. 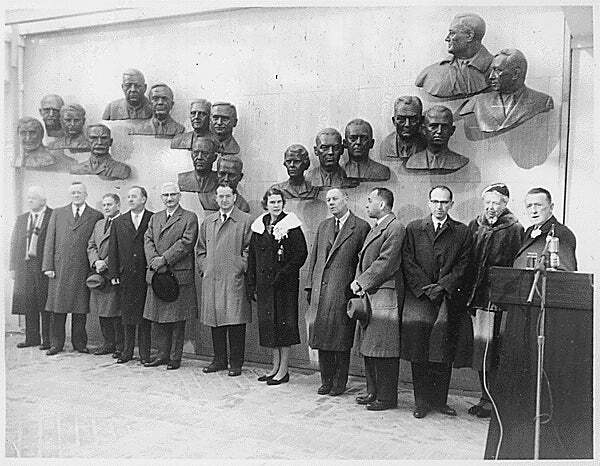 The successful results of the Salk vaccine trial are announced. 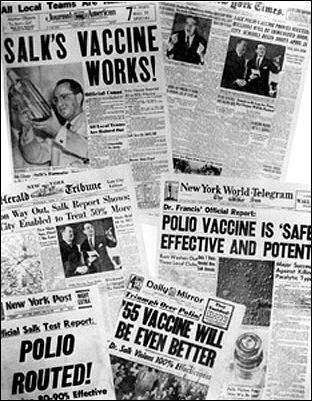 Salk’s vaccine is licensed by the Food and Drug Administration of the U.S. for public use later that same day. Albert Sabin and Mikhail Chumakov begin testing a vaccine, based on three strains of live, weakened polio virus. Over the next two years, 10 million youngsters in the Soviet Union are successfully vaccinated using this preparation, which can be given by mouth without needles. Sabin polio vaccine is fully licensed by the FDA. The World Health Organization spearheads an international program to eradicate polio around the world. 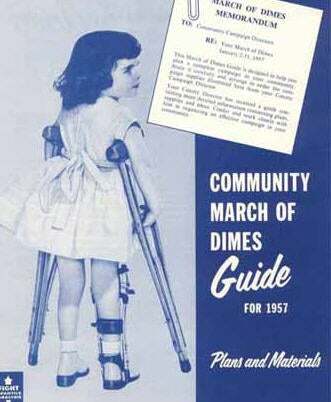 Polio cripples an estimated 350,000 children that year. 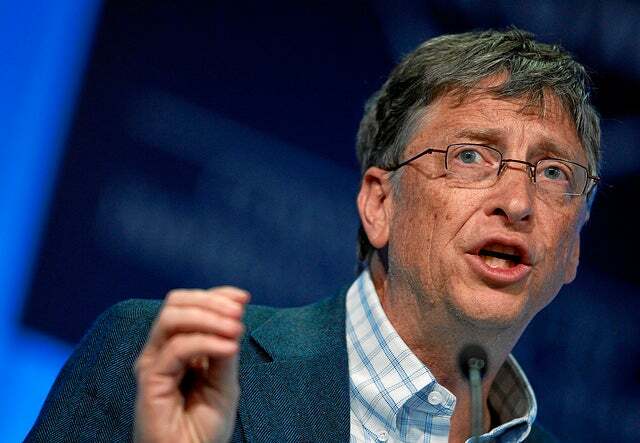 Regular multi-million donations from the Bill and Melinda Gates Foundation reinvigorate the global push to eradicate polio. Over the next seven years, the Foundation spends more than $1 billion on the effort. speaks during the session 'Polio: Eradicating an Old Reality Once and for All' at the Annual Meeting 2011 of the World Economic Forum in Davos, Switzerland, January 28, 2011. 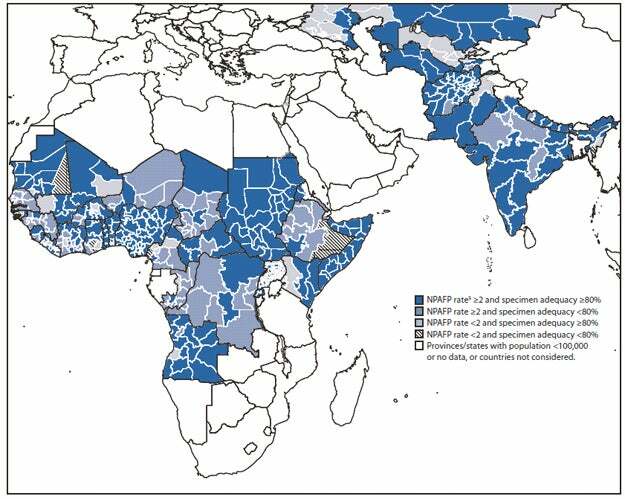 About 650 cases of wild-type polio are confirmed worldwide, most of them in Afghanistan, Pakistan, Nigeria, Chad and the Democratic Republic of Congo. India is declared to be free of endemic polio, meaning the virus has not circulated naturally in that country for at least a year. 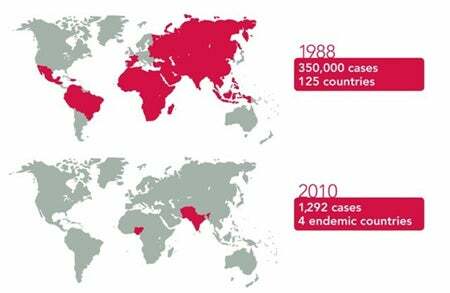 Cases of paralytic polio caused by the vaccine itself, however, still occur. 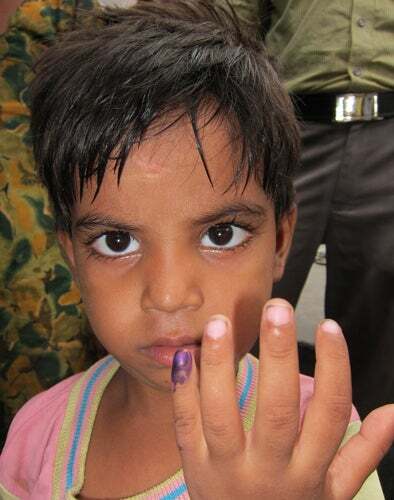 A boy in Firozabad, Uttar Pradesh, India, shows his finger, painted to indicate he has just been vaccinated. Financial support for work that included this photograph came from the Pulitzer Center for Crisis Reporting.